Many people have not yet heard about pole walking. Don’t get it confused with other types of exercises using poles…hahahaha. 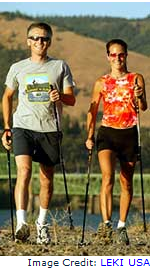 Nordic Pole Walking is like cross-country skiing without the snow. Walk on sidewalks, low tide beaches, country road using two lightweight poles. This exercise uses 90% of the body’s muscles in a way that is easy, fun, and do-able. Moderate and persistent exercise is the prescription for health…and you can happily do this with Nordic Pole Walking. Pole Walking for three 30-minute sessions will give you good health. Pole walking every other day is great. Up your time for pole walking to 60 minutes and your health will flourish. 2017 update: WHO POLE WALKS? From young (age 5) to old (92), from athletic to average, from competitive to rehab. Why do they choose Nordic pole walking? Convenient, feels good, effective.